We invite you to consider our network of over 1,000 independently owned and operated franchised businesses providing in-home home care services to seniors around the world. Home Instead Senior Care® offers the rare combination of providing an outstanding business opportunity AND a meaningful career. If you have the vision and drive to make a difference in the lives of Canada’s older citizens, we invite you to contact us for more information. If you're thinking about starting a home care business, there is one brand that has earned a superior level of trust and acceptance while experiencing a tremendous level of growth since its founding in 1994 – Home Instead Senior Care®. The Home Instead Senior Care franchise network is one of the world's largest and most respected providers of comprehensive non-medical in-home care and companionship services for seniors. These services are provided through a network of independently owned and operated Home Instead Senior Care franchise offices throughout the United States and 12 other countries. The Home Instead Senior Care network has been recognized as an industry leader by franchise and senior care experts, organizations and publications. Our systematic approach to reaching untapped market segments has created a professional resource that seniors and their family members can rely on for exceptional care. This approach gives entrepreneurs the chance to own a solid, vital business that truly makes a difference in people's lives. With nearly a quarter of all American adults currently providing some kind of daily assistance to a family member, the Home Instead Senior Care network was established with a goal of enabling seniors to live independently while bringing peace of mind to their families. Because family members can't always be there, the Home Instead Senior Care network takes great pride in making sure its CAREGiversSM are the next best resources. 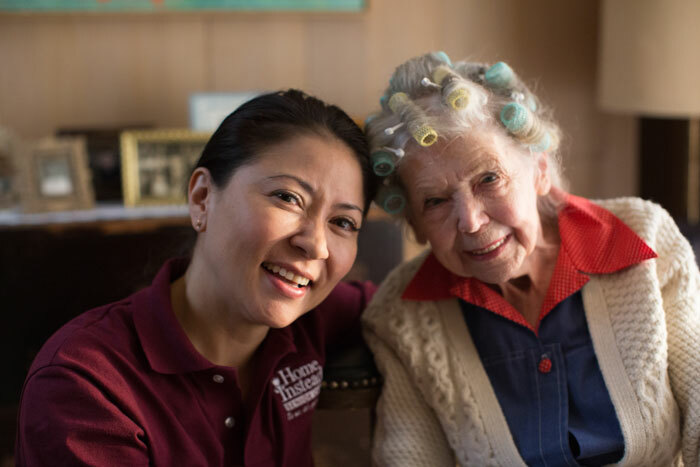 Learn more about how the Home Instead Senior Care network responds to the needs of seniors by listening to "Home Instead Senior Care: Filling a Need," a Franchise Business Review podcast featuring Home Instead Senior Care President and COO Jeff Huber. The Home Instead Senior Care network is extremely proud to have already served over 800,000 clients worldwide, providing a wide range of services – from simple companionship visits ... to arranging doctor appointments and medication reminders ... to helping with household tasks ... to assisting with daily living activities ... and so much more. Join the more than 1,000 Home Instead Senior Care franchisees worldwide who are enjoying a new sense of purpose by owning a business they truly feel good about. No segment of the population will have as great an impact on society as those 65 years of age and older. The aging of the world's baby boomers has far-reaching implications for our culture. The number of people over age 85 is projected to double by the year 2030 and double again by 2050. This aging of society brings with it new challenges for individuals, families, and entire communities. It also creates one of the most exciting business opportunities for those entrepreneurs who act to take advantage of this unprecedented phenomenon. Owning a Home Instead Senior Care® franchise makes way for possibilities you may have never thought possible. If you have ever dreamed of being your own boss and making a living doing something you enjoy—something with real value and purpose that offers an extraordinary level of personal satisfaction—then a Home Instead Senior Care franchise may be a perfect fit for you. By submitting this form, I give my express consent for Home Instead, Inc. to email me information about its franchising opportunities. I understand that I can withdraw my consent at any time. For more details, please contact Home Instead, Inc. at 13323 California St., Omaha, NE 68154 or (402) 498-4466.